The main thing is to remember that it should be 50:50 red wine to water. If you have a fortified wine like madeira or port, that counts as 2 parts of red wine, and you should use it 25:75 with water. I prefer a combination, as shown, but you can use whatever you have kicking around the house. Just keep the proportions right - 1.5 litres liquid to 3 extra large onions. First, cut the onions. I prefer to take the ends off, quarter them, and then cut so you get semicircles of onion. It doesn't really matter, as long as it's easy. Then simmer them in a large knob of butter on a medium to low heat, for half an hour. 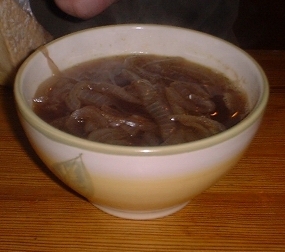 It is more important to spend time sweating the onions than to spend time cooking the whole soup. 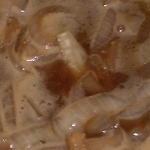 Ideally, the onions will have a small amount of bite left, but will be soft and easy to stir. If they have burnt bits, this does not matter as long as you keep stirring so they don't stick. After 30 minutes on the hob, add the wine, water and madeira, or whatever you have decided to use. Bring to a gentle boil and add the two bouillon cubes. Stir gently. Add bay leaves and then leave to simmer for a short time - 20 minutes is ideal. Turn off the heat, place lid on top and keep in the pan until ready to serve. Serve with grated emmenthal or gruyere cheese, and for a main course also serve toast with mushroom pate.